For Tito Mitjans Alayón, the best aspect of being a visiting scholar in the Hampshire College Cuba Exchange Program was discussing his work, getting feedback, and accessing academic resources. “I want to take the whole library with me,” he said before leaving Hampshire in December, at the end of the two-month program. 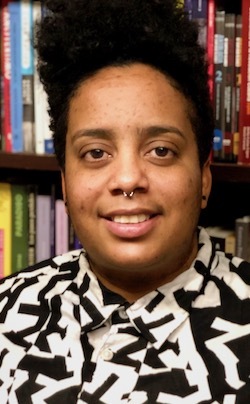 “It was good to find so much black intellectual production here, works you cannot find in Cuba,” said Mitjans, an Afro-Cuban trans feminist scholar and activist whose research centers on the knowledge produced by Afro-diasporic queer feminist movements. A PhD candidate at the University of Arts and Sciences of Chiapas (Mexico), he came to the College to present his work in progress, and help to prepare students who will participate in the 2019 Hampshire College Cuba Exchange Program. The program is one of the oldest of its kind involving the island nation. Since 2000, every spring a group of Hampshire students has gone to Cuba to execute a semester-long independent-study project. They receive one-on-one tutoring and are mentored by some of Cuba’s most prominent intellectuals and artists. Mitjans himself worked with Hampshire students in Havana from 2012 to 2017. “We provide the opportunity for scholars, especially those who work with us as tutors or part of the academic committee in Havana, to come here to have a scholarly or an artistic residency, to be able to live on campus, to take advantage of the library,” she explains. Among visiting scholars have been the writer Mirta Yáñez, the vice president of the Alejo Carpentier Foundation in Havana Rafael Rodríguez Beltrán, and the musiologist Cary Diez. Hardesty says the program wanted to bring Mitjans to Hampshire in 2017 but his promised visa never came. “We worried it was because that year the ability for Cuban artists and researchers to get a visa to come to the United States was all but shut down,” she said. It took 14 months, but then — suddenly — the visa arrived.